In a Nutshell: Despite the links to consumer surveys at the bottom of every receipt and customer-facing email, it can be difficult to maintain engagement long enough to get actionable feedback. 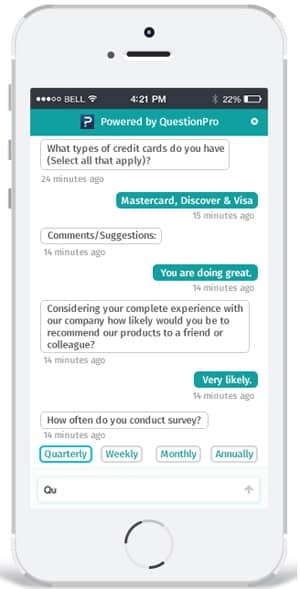 Experienced survey and analytics company, QuestionPro, is turning surveys and forms into insightful conversations with new Conversational Forms. Designed to look and feel like an interactive online chat, Conversational Forms receive five times the responses as traditional surveys by engaging customers and providing a more personalized experience. The chatbot also provides many of the robust reporting features of the QuestionPro core products, including the easy-to-use Dashboard for a quick breakdown as well as comprehensive, exportable raw data. A few short generations ago, a business could be successful simply by creating a better product than its neighboring competitors — or, at least, a cheaper one. Indeed, during the great rise of the big box store, customer service seemed to be systematically replaced by lower prices. According to a number of consumer surveys, however, the customer focus is shifting once again. Today’s customers appear to care more about the experience than about price, with more than half of consumers willing to pay more for a guaranteed good experience. Furthermore, it seems two-thirds of churn can be attributed to a bad customer experience. In response, companies are also shifting focus to the consumer experience, looking for new ways to engage and keep customers in a contemporary digital landscape. Unfortunately, the traditional method of obtaining customer feedback — namely, the customer survey — can itself add to the negative experience. The 12-year-old software company has long provided survey and analytics products to some of the biggest companies in the world, including technology giants like Microsoft and HP, as well as a number of global financial institutions such as Goldman Sachs and US Bank. Now, the company’s latest product is primed to take its core product suite to the next level. Although forming a connection with customers is certainly the cornerstone of repeat business, bonding with buyers can be difficult, especially in a digital marketplace. The chatbot nature of Conversational Forms helps keep customers engaged in the survey process, resulting in five times the responses obtained via a traditional survey form. Perhaps the best part of Forms is that, as with all of QuestionPro’s core survey products, Conversational Forms won’t require a technical degree to build and operate. Non-technical users can start with simple templates or use the simple click-and-drag interface to build a custom form. Those with technical knowledge can also hop into the back end for more control. 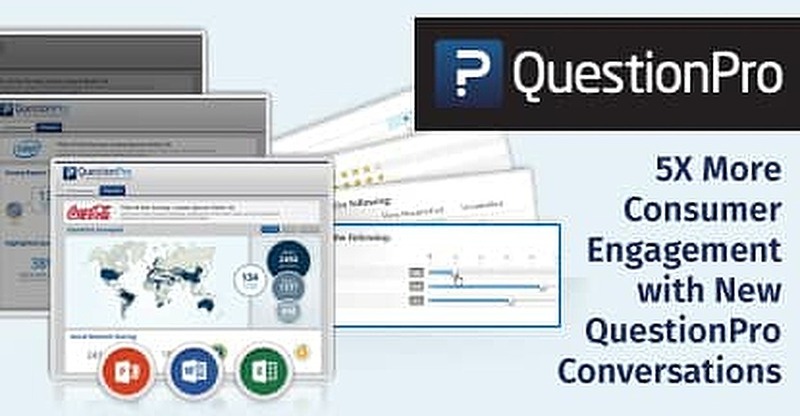 QuestionPro Conversational Forms are fully responsive, adapting to desktop and mobile environments for a seamless experience. Additionally, the forms are customizable, with users having the ability to change the names and text of each portion of the form. The look and feel can also be customized by using a pre-made theme or choosing your own colors. Users can also add custom branding, such as logos, to create a seamless customer experience. The finished chatbot can be placed on a company’s website with simple code and customizable prompts. They can also be linked for inclusion in email outreach. Another key Conversations feature shared with QuestionPro’s existing survey products is the question branching and text piping. These features allow the questions to be augmented or re-ordered based on customer responses, increasing interactivity. Of course, at the end of the day, having a wealth of consumer responses at your fingertips does little good if you can’t make heads nor tails of them. Many of QuestionPro’s robust reporting features extend to the new Conversational Forms to make analyzing customer feedback a breeze. At the heart of the Forms’ analytics is the Dashboard, which provides a series of auto-generated assessments of customer responses. At the top of the tab is the basic response breakdown, showing how many users have viewed, started, dropped out, and completed your form, as well as a map with respondents’ general geographic locations. See a basic breakdown of respondent demographics, including a map of general geographic locations, with the QuestionPro Dashboard. Next comes the question-by-question analysis, which shows the complete response list for each query by date and user ID. 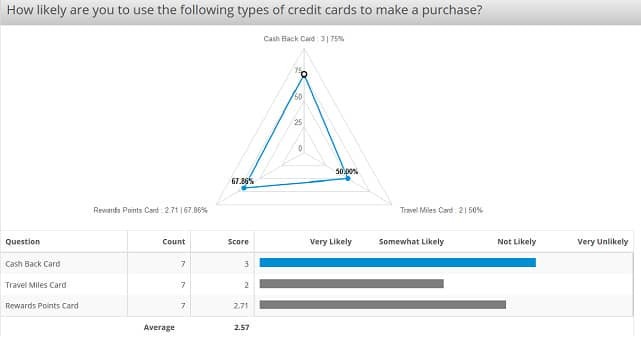 Text-based answers are given in a simple list, while responses to items with predetermined answers, such as multiple-choice items or those with drop-down selections, are displayed via easy-to-digest graphs. All of the analytics data and reports can be exported in a variety of formats for offline use, including Excel, CSV, PowerPoint, and PDF. Excel and CSV files will include the raw data for use in outside analytics programs. “The MS Excel Export produces a multi-tab .xls file that includes the raw data dump as it exists in our database. The report also includes all of the frequency data from the online summary report, as well as the frequency data for any groups that have been defined in the comparison report,” described the site. Responses to each question can be quickly observed through the Dashboard’s easy-to-read graphs. While the overview and bulk data analysis provided on the Dashboard can be useful for the bird’s eye view of Form responses, you can also choose to inspect any individual responses for a more detailed perspective. Where price once reigned supreme as the driving factor behind much of consumer behavior, many of today’s shoppers are looking for more than a bargain — they want an excellent customer experience, as well. With Conversational Forms from QuestionPro, it’s easy to turn forms into conversations, making even collecting consumer feedback into an engaging, interactive experience.